Revealing information that has been suppressed in the Chinese Communist Party's official history, Wen-hsin Yeh presents an insightful new view of the Party's origins. She moves away from an emphasis on Mao and traces Chinese Communism's roots to the country's culturally conservative agrarian heartland. And for the first time, her book shows the transformation of May Fourth radical youth into pioneering Communist intellectuals from a social and cultural history perspective. Yeh's study provides a unique description of the spatial dimensions of China's transition into modernity and vividly evokes the changing landscapes, historical circumstances, and personalities involved. 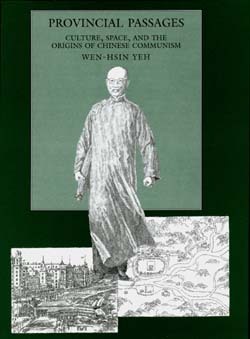 The human dimension of this transformation is captured through the biography of Shi Cuntong (1899-1970), a student from the Neo-Confucian county of Jinhua who became a founding member of the Party. Yeh's in-depth analysis of the dynamics of change is combined with a compelling narrative of the moral dilemmas in the lives of Shi Cuntong and other early leaders. Using sources previously closed to scholars, including recently discovered documents in the archives of the First United Front, Yeh shows the urban Communist movement as an intellectual revolution in social consciousness. The Maoist legacy has often been associated with the excesses of the Cultural Revolution. Yeh's historical reconstruction of a pre-Mao, non-organizational dimension of Chinese socialism is thus of vital interest to those seeking to redefine the place of the Communist Party in a post-Mao political order. Wen-hsin Yeh is Associate Professor of History and Chair of the Center for Chinese Studies at the University of California, Berkeley. She is the author of The Alienated Academy: Culture and Politics in Republican China, 1919-1937 (1990) and coeditor of Shanghai Sojourners (1993).